You have got to have this Globe Prepaid promo. 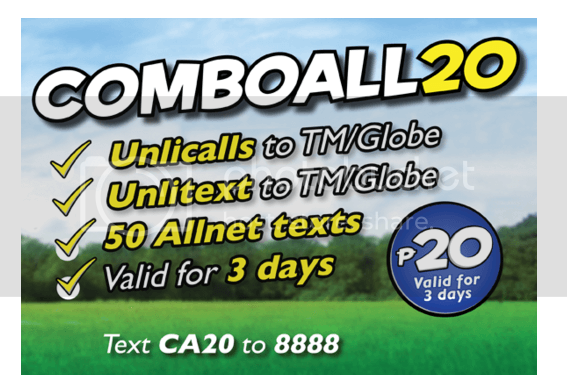 The Combo All20 Promo allows for Unlimited calls and Texts to Globe and TM subscribers. With this Globe promo you’ll never run out of means to talk with family, loved-ones and friends. Stay connected with your social media friends. Registering with Globe Prepaid Combo All20 Promo gives you FREE Facebook and Viber access and a bonus of 50 texts to all networks for 3 days. This Globe Prepaid Combo All20 Promo is available to all Globe Prepaid subscribers.